Green Cleaning Products provides a place for consumers and commercial clients to find out the latest information about natural green home cleaning, green janitorial supplies and what is new in the world of green cleaning products for the home, business, custodial, facility maintenance, food service, industrial, and institutional applications. 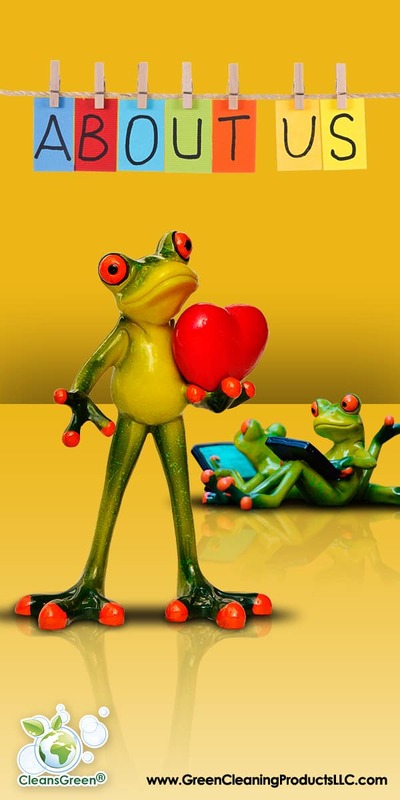 We feature green cleaning products and supplies to make every aspect of your cleaning more eco friendly. You tell us what you clean and we will find a green solution for you. 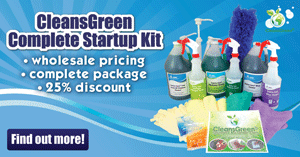 Green Cleaning Products LLC is the proud owner of the brand, CleansGreen® . 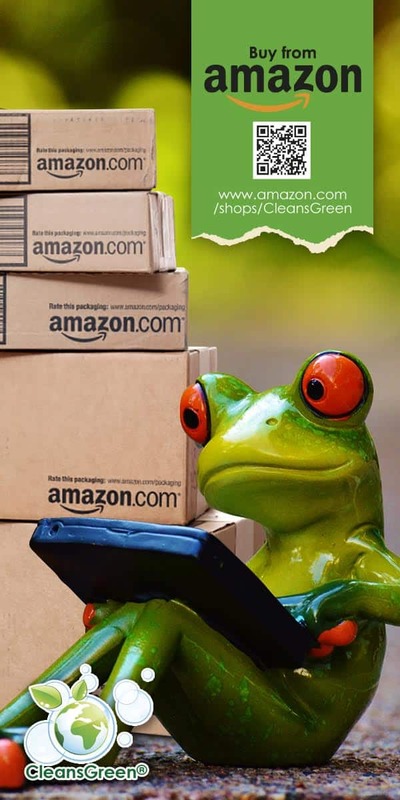 Under the CleansGreen® label a variety of products, gadgets, and tools, devices have been developed to facilitate the cleaning process in a user friendly and environmentally friendly manner that is consistent with our values. Additionally, Green Cleaning Products has chosen to represent the safe, green, clean products from Rochester Midland Envirocare product line because of their dedication to quality and natural cleaning. Here are just a few of the values they represent for a safe green clean…. The promise of a safe, green home is finally here; we offer a variety of cleaning products for you, your employees, your family and your guests that are safe, effective and all natural. And, not only are they effective cleaners, they are also harmless. Green cleaning products that are like no other cleaning product you or the people you know and love have ever encountered. Our products, from the stain pen to the window cleaner to the all purpose cleaner, are non-toxic. That means these products are 100% safe for you, your family, your employees, your customers, and even your pets. When you, your family or friends use products from Green Cleaning Products LLC, you are making a positive difference. Our goal is to deliver on the green promise in all of our operations. Many of our cleaners are super concentrated to be used in reusable spray bottles. We seek to reuse as many containers as possible. Each time you replenish your order you will receive a refill packet for the spray bottles, which you will combine with regular tap water to create a product with the ready-to-use (RTU) dilution. We are fulfilling the green promise with a greener way to clean. Green Cleaning Products LLC strives to become a leader in sustainability by modeling our core beliefs through the actions we take. Starting fresh when the company was created, enabled us to implement sustainable practices from the beginning. Thus we have been able to consider the impacts on the larger environment, as well as protect the health and safety of our team and our customers. With core values of honesty and integrity, we believe that “going green” requires a conscientious part in protecting and balancing people, profit and planet simultaneously. For instance by offering super concentrated products, we are not shipping water. As a result we cut down on fuel costs and you reduce your carbon footprint. As for the containers that are not able to be reused, they are still recyclable. Continuous improvement of our practices are integral with everything we do as managed by our Environmental Management System. Our commitment is demonstrated by receiving the highly coveted Gold Leader Level of the Colorado Environmental Leadership Program from the Colorado Department of Public Health and Environment. The secret to a safe, green clean is leveraging ingredients that are biologically based and from renewable resources. Many of the products enzyme based. Enzymes are small harmless biomolecules found everywhere in nature, you even have them in your own body. And they come in a wide variety of types, with different enzymes breaking down different compounds. What that means is that an enzyme designed to break down protein will love the meatball stain on your favorite sweater, but not the soapy film on your shower door is for a different, more soap-scum loving enzyme. And since these enzymes are all natural, wowgreen is 100% safe for the environment. These products are different from the cleaning products you know. That is because these cleaning products breaks down your dirt, stains and spills. No lingering residue remains, unlike traditional, chemical-based cleaners. With the all-inclusive range of cleaning products available, you can green your entire home or business overnight. … And at a cost that is comparable to what you already spend on cleaning products. Seeing is believing, isn’t it? Or more like no longer seeing any stains. After you have finished reading about our products, we urge you to try them for yourself. 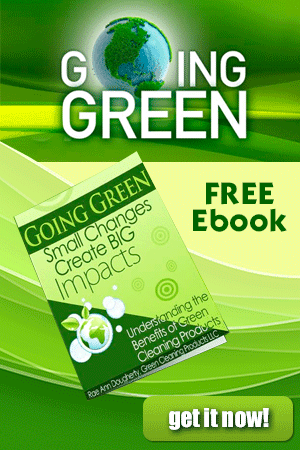 Pay attention to how easily and effectively these products clean your whole property green. That is the power of these green cleaning products. When you demonstrate these products to your family, friends and neighbors, you are fulfilling the promise of a greener world. Yes, one person can make a difference, one greener building at a time. Rae Ann Dougherty, principal of Green Cleaning Products LLC, is a seasoned business woman who is dedicated to helping families and businesses improve the quality of their environment by providing safe and effective cleaning products. Rae Ann has culminated her technical knowledge, skills, experience, and leadership to start up Green Cleaning Products LLC, a woman owned and controlled company specializing in safe, effective and cost comparative environmentally friendly cleaning products for the home and business. She is delighted to be able to deliver a new technology for cleaning that is safe and eco-friendly. As her team grows, Rae Ann is especially pleased to provide an implementation-oriented and environmentally safe solution for each household and business, no matter the size. Over 35 years ago, Rae Ann began her professional career in the environmental field and has since leveraged a myriad of successful opportunities. Rae Ann began her career before many of the laws and regulations that are currently on the books existed. She has never strayed far from the environmental field while becoming broader as more environmentally oriented issues have become regulated. Rae Ann’s implementation-oriented experience spreads across several diverse industries including: semiconductor, mining, research, construction, automotive, petrochemical, and product distribution. Prior to becoming an accomplished entrepreneur, Rae Ann served as a leader and an executive for several Fortune 100 companies. At General Motors she spearheaded the Progression and Succession Development System for emerging executives in the Powertrain Division. She oversaw the environmental, safety, and health operations during a company-wide, international, multi-billion dollar expansion at semiconductor industries leader, Intel. At Atlantic Richfield Company (ARCO), one of the largest petrochemical companies at that time, she managed and implemented several industry-wide environmental programs and organization-wide strategies as the Director of Environmental, Health and Safety. Coupled with her strong environmental, engineering technical strengths, and analytical skills, her passion is to focus on implementation-oriented solutions in everything she does. She is thrilled to serve the community in helping businesses owners and individual households decrease their carbon footprint by going green. As a distributor for Rochester Midland Corporation’s EnviroCare products and the first Independent Distributor in Colorado for the wowgreen product lines she provides you with the green solution you want. She has been so successful that she rapidly advanced to the prestigious rank of Director for wowgreen International LLC. In 2009 she was one of the first to be a certified wg Commercial Distributor. In 2010 Green Cleaning Products LLC was nominated for the prestigious Sustainable Company of the Year award from the Colorado Women’s Chamber of Commerce. As a management consultant, Rae Ann is credentialed as an Advanced Professional Consultant and has amassed a myriad of quality experience. She is a highly sought-after consultant especially for developing and growing high performance teams. Rae Ann’s leadership serves well as she seeks to educate the community to the existing environmental hazards. All of this experience is backed with a solid academic foundation that includes Bachelor of Science and Master of Science degrees in engineering and environmental sciences and an M.B.A. in engineering management. Rae Ann has won numerous awards from top companies and organizations such as ARCO, Intel and the American Meteorological Society. In 2001, she was honored with the first David E. Bailey Award for Small Business from Wells Fargo. In 2002, she was appointed to the US-Egypt Presidents Council. In 2003, her company, R & R Strategies, Inc., was honored by NAWBO with national certification as a Woman Owned and Controlled Business. Green Cleaning Products is now also recognized as a Woman Owned and Controlled Business. In 2005, she was identified by TREX as a key resource to Small and Disadvantaged Businesses. In 2006, 2007, and 2008 Rae Ann was honored as the top Entrepreneur for the Rocky Mountain Region by Peak Potentials, Inc. Rae Ann is especially honored to have been named one of the few 2009 Women of Distinction by the Girl Scouts of Colorado and nominated for the coveted Athena Award in 2010. In 2017 she was presented with the Princess Benedikte Award from the World Association of Girl Guides and Girl Scouts (WAGGGS). Throughout her career Rae Ann has been the author of several white papers and published articles that have received acclaim from both business and scientific leaders.